I'm planning on doing some Wiener Schnitzel for Sunday dinner (veal, thin/pounded thin, floured, egg-washed, breaded (panko, is my plan)) and I've got parsley and lemon lined up, cause I know that's the traditional thing. I daresay, Grub, that many a Viennese diner relished his/her combination of schnitzel with spaetzle over the years ... and personally, I like the combination because it is so very traditional. I'm not sure a bernaise sauce would work for schnitzel. I'm rather fond of taziki with it though. Small red potatoes would be wonderful with this I think, or parsley-lemon rice. Fairly plain sides. I like the spaetzle; maybe something with cabbage like saurkraut. Traditonally you serve parslied potatoes with Wiener Schnitzel as you know that Spaetzle is not an Austrian dish. Last time I was served Wiener Schnitzel with Rosti and a salad, although Rosti is also non Austrian dish but there you go. My husband, whose mom was German, grew up eating it with Spaetzle and Rotkohl (braised red cabbage). Heat oil in a large saucepan. Add cabbage and sauté until coated. Stir in remaining ingredients and bring to a boil. Simmer, covered, 20 minutes or longer, stirring occasionally, until sauce reduces and cabbage is tender. If you want to do a sauce, do a brown mushroom sauce. Presto, you've made made Jagerschnitzel. As previously suggested, some type of cabbage would be good (red, braised, kraut, etc.) as would spaetzel. A potato rosti would be fine, too. Consider a different rosti however, one made from shredded beets. A finger-staining prepration to shred the raw beets to be sure, but delicious. You can have Wienerschnitzel with warm German potato salad, with the bacon, of course. Include the sauerkraut for contrast, unless you want a heavy meal. Zo, venn are vee eatink, mein Grub?? thin slices of cucumber marinated in olive oil/vinegar, salt pepper. that's what my Austrian cookbook says is traditional, alone with the plain boiled potatos mentioned upthread. If this were my first time with schnitzel, I would make that the adventure and keep the sides somewhat familiar- you can't go wrong with mashed potatoes. As far as cabbage goes, given the choice between sauerkraut and either braised or sauteed cabbage- I'll take the latter anyday. For me any form of cabbage would be better than sauerkraut. Creamed cabbage might be nice. Speaking of creamed cabbage, a bechamel might be nice for a sauce for both the schnitzel and the mashed potatoes. OK, here is " Mr. Know-it-all " again. And I have been criticised before. Please folks, eat what your heart desires, but if you really want to be authentic, original and true to its Austrian (Wien) heritage, stick with small whole new white boiled and buttered Potatoes and a plain green Salad, not mixed greens or tossed with other vegetables, but a 'Boston' or 'Butter' Lettuce. Very delicate! And a very delicate, slightly sweetened Dressing. Never Sauerkraut but Red Cabbage is [i possible. A "Wiener Schnitzel" will never be served with any kind of 'Sauce', 'Gravy', 'gunk' or you name it. Browned Butter and a Lemon wedge, yes. A few well prepared Homefry Potatoes, from tiny parboiled, cooled and sliced potatoes, sauteed in Butter, are also acceptable. Roesti (also called Swiss Potatoes in this country) are just that: 'Swiss" . Please, friends, trust me. I was born and raised in Europe, plus absolved my chef apprenticeship there also. Now, after 49 years working literally all over the world, retired and living in Maine, my two adopted daughters (15 and 14) love their "Wiener Schnitzel", and when I make just 'Schnitzel', they know it is 'Pork. Thin slices of veal, I use the top round cut. You don't have to worry so much about tenderness because the veal is pounded. Place it between sheets of plastic and pound it flat. An excellent material for this are the ‘plastic’ box liners of cereals, just tear at the seam, they will separate into sheets. The flour coating is just a dusting, the eggs are beaten with a little water and a fork, and the bread crumbs should be unseasoned and white. Be sure to have enough bread crumbs to dip the veal into, and turn it so it comes away coated without having to shovel or pat the crumbs on. Everything is put on very gently, at the last minute before frying/sauteeing. Your pan should be two inches deep. And you need a good half inch of oil, with a little butter to give a nutty flavor. Fry each schnitzel individually and keep it moving in the oil by sliding and gently rotating the pan on the burner. That's the only way to get the coating on the veal to form a puckery, crunchy surface. In a large heavy skillet heat fat (so it is slightly smoking) about 2 cm. deep and in this slowly fry two or three schnitzels at a time, (do not ‘crowd’ the pan) turning once so that both sides are golden brown (2-3 minutes per side). Drain on paper towels and keep the cutlets warm while the others are frying. This time I will not stand corrected. Actually the real deal would be a thinly sliced cucumber salad with thin shreds of red onion dressed with white or apple cider vinegar and Styrian Pumpkin Seed oil. Ok. lots of good hints, but not quite correct. 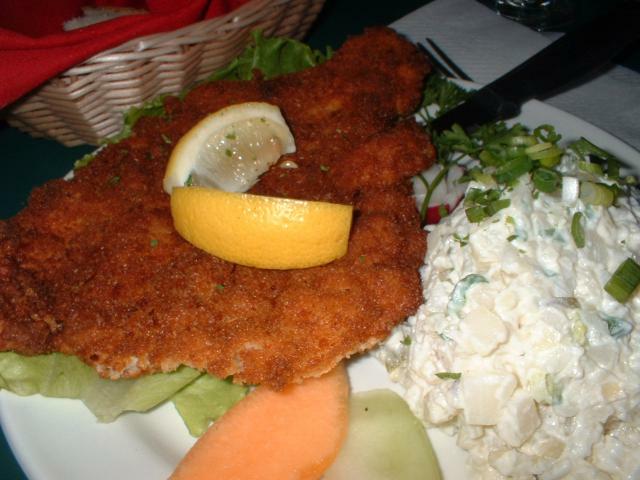 Lemon juice should be added after having fried the schnitzel. Sprinkling the lemon juice onto the raw veal meat and let it rest for 30 minutes means that the meat is nearly well done before cooking it because of the acid. Same with salting the meat. Salt withdraw the liquid of the meat. It's better to season the beaten egg with salt and pepper. No water to add because it makes the crust soggy especially when let stand for 20-30 minutes befor frying and the crust will become dark brown instead of golden brown as it should look like. So coat the meat and fry immediately. It's mostly served with potato salad or sometimes with french fries. Steamed potatoes with browned butter and green salad is also ok.
in our home it's always a green salad, austrian potato salad with white wine vinegar and shallots and - weirdly - rice. my german cousins say the rice is a moravian/bohemian oddity inherited from our grandparents. either a desperate war-time need for carbs, or they were too poor to buy anything else. the rice/vinegar potato salad when mixed actually tastes really good. for me - sauerkraut with schnitzel would never work... sorry! i'm now having a severe schnitzel craving - not good as we're off to a pub for a sunday roast. I was going to suggest potato salad, too! My usual schnitzel place serves it with potato salad (not warmed) at lunch, but roast potatoes at dinner. I agree to the above. My roots are moravian and rice was indeed the only affordable ingredient for most people and had nothing to do with war-time need. It was served with lots of fat - preferably butter - and just on Sundays or religious holidays. Sauerkraut with Schnitzel is a no no, absolutely unusual like herring with jam. This batch was fried at a higher temperature than the others, so it took on a darker color, btw. I went with small read potatoes, boiled & fried (and fresh dill). English cucumber and red onions thinly sliced and marinated in apple cider vinegar. And veal scallopini dredged in flour seasoned very gently with salt and pepper, dipped in beaten eggs (no water), and covered with Japanese Panko breadcrumbs, with a little finely chopped parsley – and parsley added on the plate (as well as lemon juice). Adding parsley to the crumbs was probably not a good idea – the parsley tends to get burned by the time the cutlet is done. They were also quite under-seasoned, and I notice someone in this thread saying to add the seasoning to the egg mixture, rather than the flour, so maybe I'll try that next time – as well as just using more of it. The Panko crumbs were fantastic. The overall texture is quite different from normal crumbs, so someone who's really hooked in the traditional style might not go for it, but I loved it (as did my guests). The crust was extremely crunchy, but also very “airy” and light. And yeah, Sauerkraut wouldn't be a good match for this at all. Next time around, while I won't add anything to the crumbs, I think I'll add more seasonings to the eggs or flour – not just salt and pepper, but maybe a pinch of cayenne or hot paprika, maybe some thyme. I'll have to think about that. Now, the use of veal scallopini was an oversight... I figured this would be easier, since they're already flattened – but they were really small. I've used these before for Saltimbocca, but I don't remember them being so small. So instead of making a few, big slabs of Schnitzel, I ended up with about 20 really small ones. It completely threw my timing off, and was a lot more work. my boyfriend in college was austrian and his mother made rice with peas as the side dish (the rice was cooked stovetop then warmed in a sautee pan with the peas almost like fried rice but without much seasoning). she also served it with potatoes and braised red cabbage. if the panko is too crunchy, a lot of restaurants just buzz the panko to make it more like bread crumbs. grub, your dinner looks deeee-lish!